Behr Enterprises uses only the highest quality machinery and materials to create custom fabricated metal components. Browse our metal fabrication gallery to see our heavy duty metal fabricating machines in action and some of the custom components we have manufactured. Behr-Enterprises is proud to offer a wide variety of metal fabrication services for virtually any industry throughout the country. We produce only the finest custom metal products using state of the art technology and the finest metal cutting techniques. You can be confident Behr Enterprises will get the job done on time and within your budget, whether you need a single specialty component or regular laser cutting services. 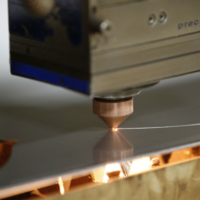 Our entire team has years of experience in metal fabricating, ensuring each product is manufactured with exact precision and the perfect finish. No project is too big, too small or too complex for our talented team of metal fabricators. In addition to our metal fabrication services, we also provide custom stainless steel fabricating services. Stainless steel is rising in popularity due to its incredible durability, easy maintenance and resistance to bacteria. It also has a natural color which complements nearly any setting. We are capable of fabricating anything from new stainless steel countertops in a diner to residential cabinets. Whether you are a hospital, restaurant, school, garage, or home in need of stainless steel products, Behr will deliver quality services with exceptional results. Behr Enterprises consistently produces the highest quality products with quick turnaround times. Invest in quality and rely on Behr Enterprises for all your custom metal fabricating services. Contact Our Wisconsin Metal Fabrication Shop For All Your Business, Commercial Or Residential Needs.